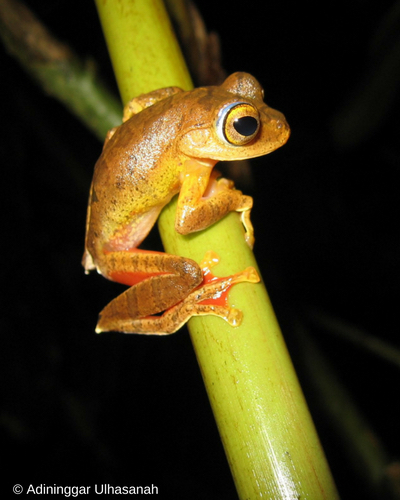 In 2004, the Conservation Leadership Programme (CLP) funded a project led by Dr Mirza Kusrini to research frog diversity in one of the last pristine forests on the densely populated island of Java. With ongoing support from CLP, she has since blossomed into a leading authority on amphibian and reptile conservation in Indonesia. 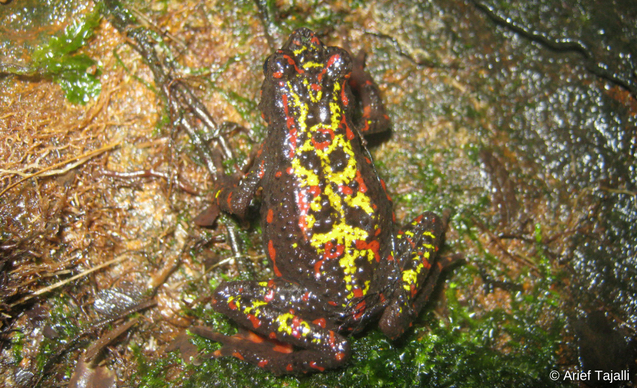 Mirza’s initial research uncovered the first known chytrid infection in wild frogs in the whole of Southeast Asia. Subsequent CLP support for her work in the form of a Follow-up Award in 2006 enabled her to extend the remit of her project and embark on a career path that has seen her rise to the top of her chosen field. 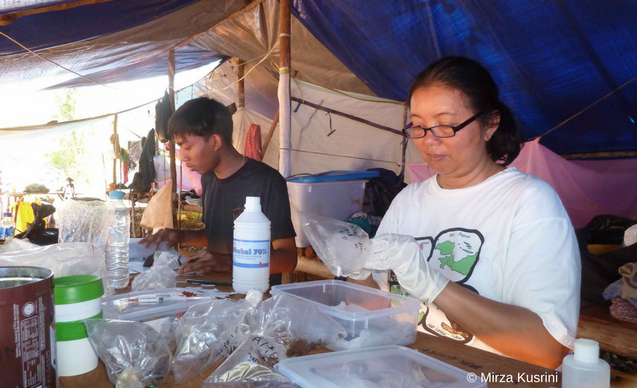 A passionate advocate of environmental education, Mirza has led numerous initiatives to increase public understanding of frogs’ importance and their role in the ecosystem. 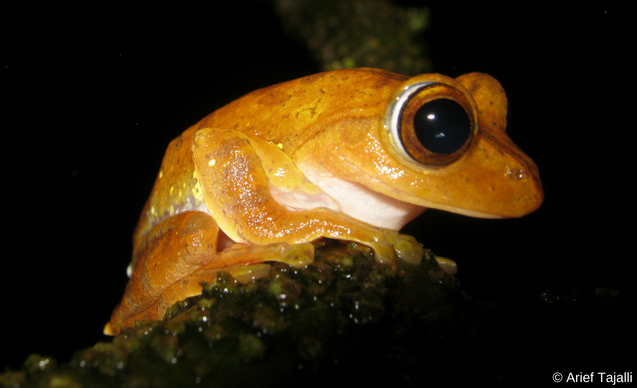 Alongside her research into the ecological impact of the trade in edible frogs, Mirza has also devoted her energies to developing herpetology research in Indonesia, contributing to the growth of national expertise by raising funds, running training courses and fostering research sharing between students in order to build the capacity of young amphibian researchers. 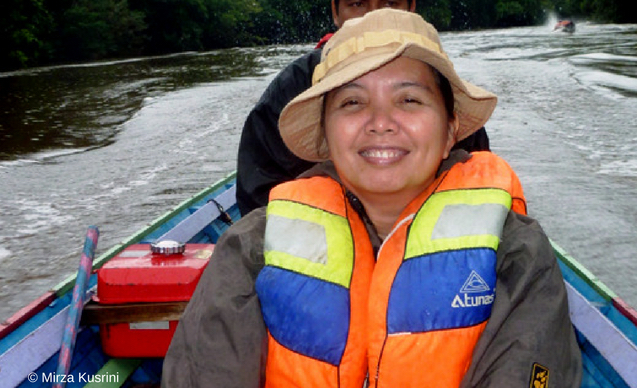 She co-founded the Indonesian Herpetologist Society, serving as Chair for five years, and has sat on the steering committee of the IUCN Species Survival Commission since 2009. Mirza also advises the Ministry of Forestry on wildlife trade and biodiversity conservation issues. In 2015, she won the Marsh Award for Terrestrial Conservation Leadership in recognition of her services to Indonesian conservation. Here is an insight into Mirza’s career, including what inspired her, what she has achieved, and what the future may hold for her. I believe that my love of the outdoors and of nature as a child drove me into it. Our family had a boat that we used for going out to the islands near Jakarta at weekends. It was in the mid-70s, so the sea was not as polluted as it is now. My parents also loved giving books to read and I grew up with a young adult series about a family that had a zoo, and the sons went around the world to bring animals from the wild. Their adventures really made me want to study animals. So, during high school and university, I was really involved with nature groups. 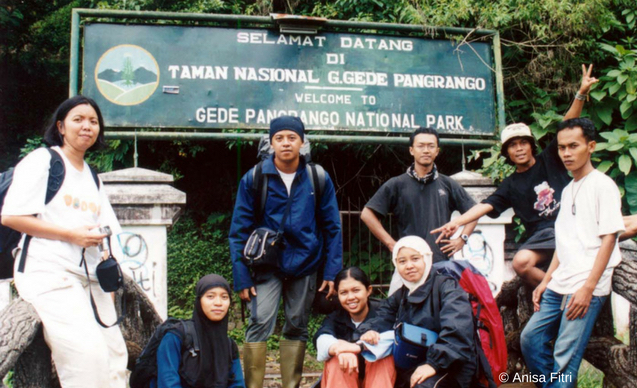 Trekking to the jungle and hiking to the mountains was part of my weekends during high school, but it was in university that I started learning about environmental issues and conservation. I was also lucky to be involved with Operation Raleigh in Seram during my third year. I spent three months there, interacting with international volunteers and scientists. I think my fate was sealed after that expedition; I decided that I would work in areas that allowed me to study nature and help preserve pristine areas as much as possible. Did you have a role model, or someone who inspired you? There are lots of people who have inspired me. I loved David Attenborough because his documentaries and communication skills have opened up lots of people’s eyes to how beautiful wildlife is and how fragile nature is. However, I think I am really inspired by three female primatologists: Jane Goodall, Dian Fossey, and Biruté Galdikas, above all because they are women. I always felt that conservation work, despite its quite feminine nurturing aspect, is seen as a man’s world, especially when you are doing lots of fieldwork in remote areas. Somehow, these women were not afraid to do it, and they succeeded. Why are you particularly interested in frogs? Again, this comes back to my childhood memories. My father was an entrepreneur. One of his businesses was selling frogs’ legs (he also tried his luck on orchids and ornamental reef fish). Our house on the outskirts of Jakarta had rice fields around it. I still remember going out at night to catch frogs. When I started doing my PhD, I was wondering whether the frogs in the rice fields were still as abundant. I was surprised when I realised that Indonesia is one of the biggest frogs’ legs exporters in the world and yet nobody had really studied that. My fascination with studying frogs actually started before my PhD. I was thinking of focusing on species that not many people in my lab were working on. I was a lecturer at the Faculty of Forestry and the lab where I worked already had three ornithologists and two mammalogists. I had grown to like frogs as they were sometimes in my house; in plant pots, in my shoes, in my bathroom. Some looked different, so I realized they must be separate species. At the time, a book by Djoko Iskandar on the amphibians of Java and Bali had just been published. My mentor at the lab knew about my fascination for frogs and she gave me the book – fresh from the writer himself, as she had been invited to the book launch and received one as a gift. So, using that book, I began to learn about the frogs around my campus with my students. I was surprised that we actually had so many amphibians but knew so little about them. How did you first become aware of CLP? Even before finishing my PhD, I had already made up my mind to work on amphibian conservation. 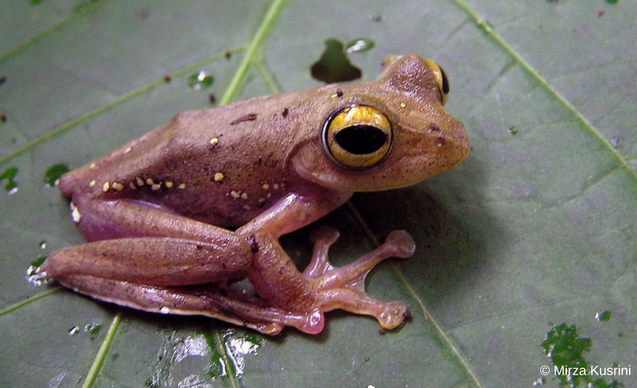 The province where I lived had the first national park in Indonesia, but there was not much data on its amphibians. Unfortunately, amphibian conservation was never a priority! I applied unsuccessfully for funding from my university and the government. Some people even remarked that there was no point studying amphibians or conserving them! I knew that I needed outside help and began exploring other options. I came across CLP (then the BP Conservation Programme) while browsing the Internet and thought it was worth a try. That was how I got the funding for my work in Mount Gede Pangrango National Park. More than 10 years after that CLP project finished, our research there is still continuing. Of course the funding helped a lot, but more than that, CLP helped to nurture our capabilities by giving us the chance to network and increase our knowledge. CLP’s involvement did not end when our project finished; instead it constantly stayed in touch and nurtured us by offering opportunities to go to international conferences and to help in mentoring more recent award recipients. It also enabled us to get to know and interact with fellow international conservationists, which gave us a lot of ideas to improve our conservation effort. 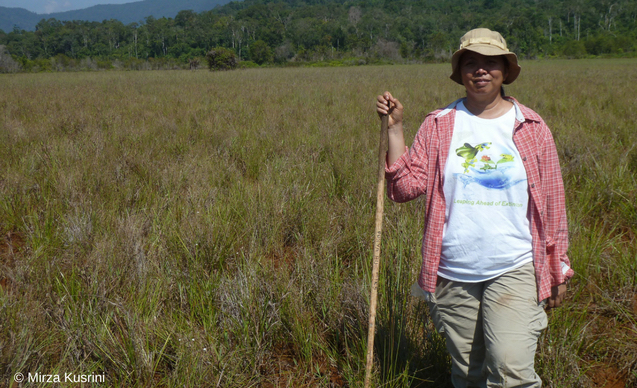 As a woman, have you found it difficult working in conservation in Indonesia? Not really, but of course there is always somebody who underestimates you because you are a woman. I remember once getting a surprised look from someone who knew me only through email and when he saw me he said in a slightly dismayed voice: ‘You’re a woman’. In the end, you just need to work as hard as you can and you will get the respect. My work is not only research. As a lecturer, my job is mostly to teach and supervise students on their own research projects. My work enables me to travel to various natural areas around Indonesia, which is a real privilege. However, the most rewarding aspect is to see my students develop to their full capacity and gain confidence while they are under my supervision. Most of them work on amphibian and reptile projects, but not all of them become herpetologists. Some end up working at NGOs, on plantations, or even for the government. Sometimes I feel that I might be too hard on them, but whenever an alumnus meets me and says they feel fortunate that I instilled the right work ethic during their supervision, which enables them to perform well in their current job, I feel that is the best compliment I can be paid as a teacher. I’m proud to say that I’ve played a big part in developing the Indonesian Herpetological Society. When I started doing research on amphibians, it struck me that there were not many local herpetologists. Getting to know the other established herpetologists was also not easy as there was almost no means of interacting with each other. So after giving several training sessions, I made sure that the trainees were still connected to each other through a mailing list and decided to hold the first herpetological seminars in my university in 2007. Afterwards, the network grew and in 2008 we established the Indonesian Herpetological Society. I was the president until 2013, but I’m still actively involved with the society to this day. What are Indonesia’s biggest conservation challenges? I think the challenge is to balance economic development and environment sustainability. Our natural landscape has changed rapidly into plantations, mining and urban areas. The remaining protected areas are under threat from encroachment and overharvesting of wildlife. A lot of people living in the villages adjacent to the forest or in the forest enclave are poor and uneducated. In the past, they took natural resources from the forest solely for themselves. But then, with modernisation and the lure of instant money from city dealers, they began to take more and more. They don’t really understand that in the end they will be the ones who lose out from this kind of extraction. Once everything is gone, the dealers will be gone too, and life for the local communities will be harder than ever. We need to teach them to be economically self-sufficient so they will be able to help in conservation. In addition, we also need to make them understand that conservation is not a negative thing and that they can benefit from it. Whilst Indonesia is blessed with mega-diversity, having so many species actually makes conservation a bit harder because human resources and funding are limited. There is so many things to consider and in the end most of the funding goes to charismatic big animals. I think the key is perseverance, even if you don’t work with high-profile species and the funding is limited. When I started doing work on amphibians, herpetology was not a popular subject and the chance of getting funding from local donors was very slim. At the time, if you worked on an environmental impact assessment, the wildlife aspect always focused on birds and mammals. Today, amphibians and reptiles are also seen as important indicators, so there is an acknowledged role for herpetologists in environmental assessment work. You need to do a lot of networking, not only with your peers, but also with people in the government. A lot of conservationists work for NGOs that tend to disagree with government policy and are reluctant to engage. I don’t think that is a constructive approach, as we need to keep them well informed to enable them to develop effective policies for managing our natural resources. I plan to keep doing research on amphibians and nurturing young herpetologists. I’m currently doing a project with funding from a National Geographic Asia Conservation Grant to increase the capacity of young herpetologists and developing a citizen science network for Java and Bali. Our aim is someday to develop the Atlas of Amphibians and Reptiles of Indonesia. With the help or our herpetology society members we are also proposing to re-assess the red list status of Indonesian amphibians. Don't be put off by other people’s comments; do things that you are passionate about. Don’t be too worried if the focus of your work is not a popular choice. Keep learning and don’t be too shy to contact people who are already well known in your chosen field and ask them for guidance. CLP has enabled me to expand my networking outside Indonesia and increase my knowledge in conservation management. Meeting with CLP winners and CLP teams from all over the world makes me feel like one big family and keeps renewing my energy to do more for conservation.